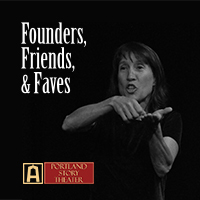 We kick off the 2015-16 season in September with our newest Mainstage show, Founders, Friends, & Faves, featuring some of the most talented storytellers in Portland, appearing by special invitation along with founders Lynne Duddy, Lawrence Howard, and Penny Walter. This season kick-off will feature Leigh Hancock, Warren McPherson, and John Mink. These are true, personal stories told eye to eye, face to face, and heart to heart; stories that matter.